And so, just 18 hours after getting “the call,” we met the birth mother’s social worker in the hospital lobby, got in the elevator, and headed up, up, up to meet our daughter for the very first time. All I can say is that it was indescribable, surreal, and unbelievable. I’ve been working in the field of adoption for over 10 years. Thousands of families have been created through my agency since I started working there, yet, as it was actually happening to me, the experience exceeded all expectations. The elevator doors opened…and the only thing that kept me from running down the hallway was that I had no idea where I was going. So I tried to look calm and cool as I followed on the heels of the agency social worker, thinking, Oh, my gosh are we there yet, how LONG are these hallways?! As we passed the nurses’ station I felt all eyes on me. Certainly not in a bad way, as I was also greeted by warm smiles. We turned the corner into an empty hospital room and, moments later, I heard a nurse announce, “Here she is, isn’t she gorgeous!” I turned around to face the door and saw this sweet little baby bundled in a wrap with only her beautiful face peaking out. Gorgeous indeed! In a little over 19 hours we went from being a waiting family to holding “Sweet Pea” in our arms. It took only seconds for the depth of what was happening to hit. As I stared through my water-filled eyes at her, my heart was soaring with joy, but at the same time, I was experiencing a very deep sadness. A pain of empathy for her birth mother unlike anything I’d experienced. It is hard to explain how a moment can be both extremes of joy and sorrow simultaneously. I wanted desperately to run to her birth mother and throw my arms around her, not only for the beautiful blessing she gave us, but out of love to offer some small comfort for what she must be going through. Sweet Pea’s birth mother was very much alone throughout her pregnancy and the adoption process, without any family support. 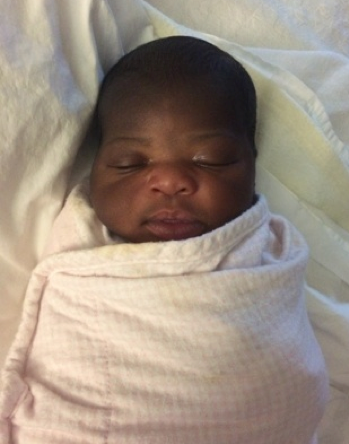 We weren’t able to meet her because she had already left the hospital—the baby was born on a Saturday, and it wasn’t until after leaving the hospital on Monday that her birth mother selected our adoption profile. My heart ached as I thought about what she must be going through after leaving the hospital and signing the placement paperwork. From what we knew, there wasn’t anyone in her family who would understand her pain or be there to give her a hug or to let her talk out her emotions. My heart instantly filled with love for her—a true and genuine love that I didn’t expect to happen as quickly as it did. It is hard to explain how I can love a person I’ve never met, but all I can say is that I do. She and I share a bond that no one else will ever have. We are both mothers to Sweet Pea. There is not any other person on earth who shares that with us. It bonds us forever in a way that my words can’t describe, but my heart certainly feels. So, in the first moment I held our daughter, my heart was rejoicing and breaking all at the same time. We are honored to have been selected to be Sweet Pea’s parents; blessed beyond measure to have this precious little girl in our lives. From the first moment we met her, she became a part of who we are, and so did her birth mother. In Delaware, there is a 14-day revocation period for birth mothers, which means that Sweet Pea’s birth mother had 14 days to make sure that she was making the right choice. As I mentioned in a previous post, this is an extremely important aspect of the adoption process. Sweet Pea’s birth mother should have these two weeks to decide if she is 100-percent sure that adoption is the right choice for her. From that first day in the hospital until the last day of the revocation period, my husband and I started each day thinking, “today is another day we have been asked to be your parents while your birth mother makes the most difficult decision of her life.” The revocation period will not cause us to hold back our love—how could we with this precious little girl in our arms—but to love with the gratitude of knowing that we have been asked to be her parents for one more day. Stay tuned for the next post about our amazing hospital experience. I can understand your situation pretty well. The anxiety mix happiness while meeting the newborn in hospital is difficult to explain. Congratulation for becoming a mom! By Adopthelp on Wednesday, August 19, 2015 at 9:09 am. THANK YOU, THANK YOU, THANK YOU! This is EXACTLY how I felt in the hospital. I was in the delivery room and had been to most dr appts. It was hard to balance these two emotions!! By wdwlvr94 on Thursday, August 27, 2015 at 11:18 am. congrat for your new bundle of joy. By Adopt Speaks on Thursday, August 27, 2015 at 11:49 am. By Kristy Hartley-Galbraith on Friday, October 02, 2015 at 8:48 am. The exciting for becoming a mother is found quite high among women. It brings sweet memory for creates some emotional moment for us; therefore after having a baby people say that life is going to change. I know the responsibility is quite high and requires high level of dedication; therefore we never ever forget the moment when we become parents. By braydonmiller on Thursday, October 29, 2015 at 4:44 am.